At this event, the new team was introduced. The club management has previously signed a contract with several new players, and also extended its cooperation with most of Kazakhstan athletes. The roster of «Astana» for the season 2017/2018 is the following: Rustam Ergali, Rustam Murzagaliyev, Anton Ponomarev, Alexander Zhigulin, Dmitry Gavrilov, Maxim Marchuk, Denis Degtyarev, Vadim Shcherbak, Anatoly Kolesnikov, and legionaries represented by Justin Carter, Larry Gordon, Ike Udano, Hordur Wilhalmsson, Anthony Clemmons and Leonidas Kaselakis. The coaching staff of the club is new as well. The management of the basketball «Astana» has appointed the new head coach of the team, the Greek specialist Costas Flevarakis, and his aides: Kostas Papazaglu, Costas Masuras and Mikhail Karpenko. In addition to the updated roster of athletes and team coaches, at the event, a new game uniform was presented. At the end of the main part of the event, «Astana» professional basketball players played with students of Children's Basketball Academy. 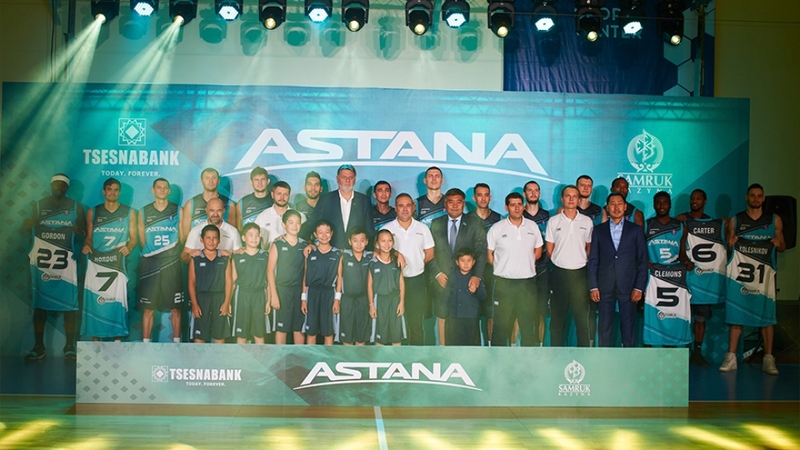 The new basketball season for «Astana» athletes has begun in mid-September. The team took part in Asian Champions Cup 2017, the largest continental basketball championship, which took place from 22 to 30 September in the city of Chenzhou (Hunan Province) in China. Kazakhstan basketball players won in the semi-final and became bronze medallists of this competition. «Astana» is the first basketball club in the history of Kazakhstan, which became the medallist of this large basketball championship in Asia. Prior to the competition in China, the team had a training camp in Lithuania, where athletes held six friendly matches with leading Lithuanian teams. «This year our basketball team has many updates. As you can see, we signed contracts with several new foreign players, and the invitation of these athletes did not cost the club a lot of money, but they demonstrated their effectiveness at the Asian Champions Cup, which took place last week. «Astana» had third place in the most important Asian championship, and this is very significant, as for the first time in the history of this competition Kazakhstan won a prize medal. Now the guys have set an excellent start, and we are expecting that them to go on this way the entire season. Our athletes once again proved that, despite the reduced budget of the club, the team could show good sporting results. As you know, «Astana» basketball players are the current champions of the National League of Kazakhstan, the five-time champions of the Cup of Kazakhstan, and moreover, the team regularly enters playoff round of the VTB United League. Looking at the rapid development of professional basketball in Kazakhstan, we understand that it is necessary to raise a professional sports reserve to strengthen the team in the future. As you know, at the beginning of this year we have opened Children’s Basketball Academy. Now over 300 children practice there. Two gyms at the Nazarbayev University and at «Astana» International School are well equipped, where all the conditions for professional basketball training were created. We continue to work on the development and popularization of basketball in Kazakhstan and there are more victories and triumphs ahead of us. I wish our athletes a successful season!», Darkhan Kaletaev commented on the start of the new basketball season. «I want to thank our sponsor of « Samruk-Kazyna « for the help provided to our club. This season will be interesting and challenge for us. The tasks for the team are challenging, I think the season started well for us, a bronze medal in the Asian Championship is a great achievement so far. I want to say thank you to all the fans, and to all our supporters. The first game in the new season of VTB United League will be held on October 8. «Astana» will hold a home game against the champion of the League «CSKA» Moscow. It is important to note that before the start of the 2017/2018 season, the basketball club introduced a new ticket system. From now on, the entrance to”Astana” home games is charged. The cost of tickets varies from 100 to 500 tenge. Tickets can be purchased online on Ticketon.kz.